Oho ( Wang P’ou ) visiting his mother’s tomb to comfort her during a thunderstorm. Shows peasants fleeing the zigzag lightning bolts. 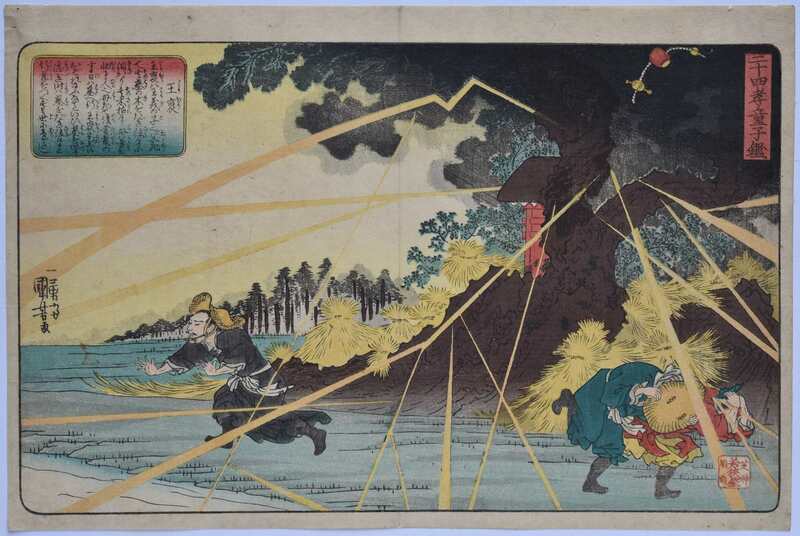 From a set of fourteen prints: Nijushi-ko doji kagami, “Mirror of the Twenty-Four Paragons of Filial Piety.” Published by Wakasa-ya Yoichi, c 1840. Each print shows an example of a child’s exemplary behaviour in looking after their aged parents There is a strong western influence in this set. Robinson S13.14. Very good impression and colour. Slight centre fold, otherwise good condition. Signed Ichiyusai Kuniyoshi ga.